Professional Scrum Master is the one who is expertise in Scrum theory, methodology, and practices. The primary responsibility of a Scrum Master is to support and promote Scrum. 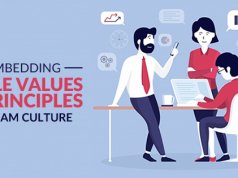 He also helps others to understand the principles, rules, and values of Scrum. He is known to offer his services to the product owner, to the development team, and to the organization. As we have described in the previous article Introduction to Professional Scrum Master, there are three different levels of certifications to become a Certified Professional Scrum Master. The first one is the PSM I Certification, so let’s start to understand the PSM I Certification exam and how to prepare for it to become PSM I Certified. The Professional Scrum Master (PSM) Certification introduces the principles and theories of empirical process control, which are the pillars of Scrum. It focuses on the role of scrum master. The industry highly values PSM I certification, and rather economical to get. In my conviction, it is the best certification for the Scrum. PSM I certified candidates demonstrate that they have knowledge of all the concepts of applying Scrum and have a harmonious terminology and approach to Scrum. Therefore, if you are the one who wants to validate your expertise in Scrum framework and application, the Professional Scrum Master Level I (PSM I) certification is right for you. 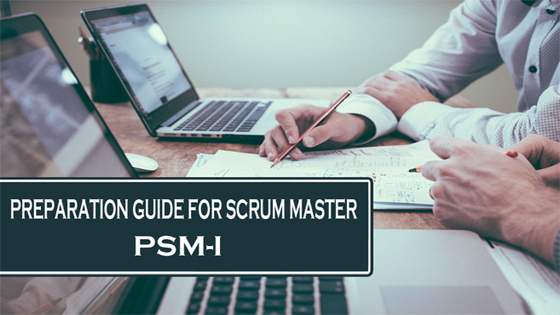 Once you pass the PSM I certification exam, you will be recognized as a Scrum Master throughout the industry and will be known as PSM I certified professional. How to Prepare for PSM I Certification? Before applying for the PSM I certification exam, make sure that you have enough understanding of Scrum. Moreover, we have devised a preparation guide for you to prepare for the PSM I Certification exam and pass it on the single attempt. Devising for Scrum: The PSM I certification exam is known as the most meticulous certification exam across the industry. It helps you to become a certified and industry recognized Scrum Master by figuring out your Scrum knowledge. Devising for scrum refers to the process of thinking about and organizing the activities required to achieve the desired goal of becoming scrum master. Start with Scrum study guide: Everyone has their own preference over books but the best resource for understanding Scrum framework is the Scrum Guide It consists of the core concepts that make you understand the functionality of Scrum. 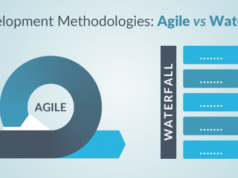 Take your time while reading scrum guide since it needs comprehensive reading, not the quick one. Familiarize yourself with the Subject Areas – To understand the subject areas of the exam is very important while preparing for an exam. The exam objective has already been mentioned above, read them carefully and prepare through the suggested readings for each subject area. 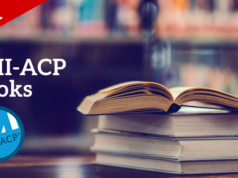 Take Free Practice Test: The practice test is a good contraption to evaluate your preparation and readiness for an exam. You can start your preparation for the PSM I certification exam with the Scrum PSM I Free Assessment or Whizlabs PSM I Free Test. The free practice test contains a set of 25 questions. These practice questions have been devised from the previous assessments only. These will give you an idea of questions which would be asked in the actual assessment. Practice with Exam Simulators: Once you have gone through Scrum Guide, Subject Areas, and Scrum Books and have been well-prepared. It’s the right time to test your preparation level by taking some online practice tests. 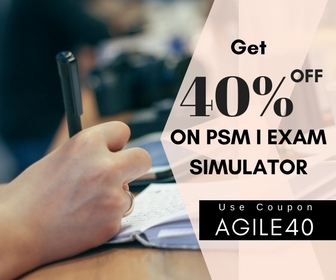 Whizlabs PSM I Exam Simulator is the best study material to check your current level of preparation, find your strengths and weaknesses, work in weak areas, and thus get fully prepared for the certification exam. Online Articles and Forum Discussions: At present, there are a large number of technical blogs where you can find articles on Scrum. If you are good at reading articles, it can help you a lot. With some research skills, you can find articles on each and every topic of the PSM I certification subject areas. Also, there are some discussion forums, you can participate in them to get the answer to any query about the exam, exam objective, exam information, and exam topics. If you have any query/question about Professional Scrum Master or PSM I Certification Exam, participate and write now in Whizlabs Discussion Forum. All of your queries will be answered by the Subject-Matter-Experts and the Certified Professionals. Being Concentrated: Being concentrated on the exam during preparation is equally important as that of studying. The question arises here is how to do this? It depends on you. How to remain concentrated? Take the exam in your comfort duration (e.g., avoid selecting morning shift exam if you’re not an early riser) and move to a silent place to take the exam. Deep Understanding: Just learning doesn’t help. Having a significant knowledge enables you to answer questions correctly, you haven’t come across before. So, if you find “XYZ should be ABC,” question yourself why; think what happens if it hasn’t been like this; ask yourself how this principle is connected to other principles; and how they can be used to find a solution? Manage your time: Spend your time appropriately on the questions; e.g. don’t spend much time on the hard questions in the first half of the exam, just mark them and use some last good minutes on them, trying your best. During the exam, don’t even try to search the answer for a question on the search engine, say Google. Only the time will be wasted if you do so. Keep in mind that you are required to answer 80 questions during the time period of 60 minutes only i.e. 45 seconds per question. Answer all questions: As there are no negative points for wrong answers so attempt all the questions. It is recommended that you should answer all the questions in the exam whether you are sure or not about the answer. Look in on whenever required: An important point you should remember is that the PSM I certification is an open book type. Although it’s not recommended to Google the answers to all the questions, you can look in on to find the answer to the specific and direct questions. The questions asking for the value, duration, rule etc can be searched on Google. So, if you want to just confirm the answer, don’t forget to look it on! So, being very honest I want to keep one thing clear in your mind that there is no shortcut to success. This statement also applies here; there is not any ready-made formula or shortcut method to become a certified Professional Scrum Master. You need to study hard and prepare well. Remember that there is no value of being certified if you don’t have sufficient knowledge about the subject matter. So, if you are planning to attempt the PSM I certification, this preparation guide is for you. All you need to do is, just go through this preparation guide and implement it during your preparation. And trust me, this PSM I Study Guide will make the preparation very easy going. Also, you will be confident enough to pass the PSM I certification exam on the first attempt only. Good luck to those of you who are preparing and attempting for PSM I Certification! If you have any question/doubt just write below in comment section or write here, we will be happy to answer!